Ruidoso Downs Race Track announces major corporate sponsors City Bank, Admiral Beverage Inc, and Sierra Blanca Motors For 2019 racing season that opens May 10. RUIDOSO DOWNS, NM—APRIL 8, 2019—Ruidoso Downs Race Track and Casino welcomes major corporate sponsors City Bank, Admiral Beverage Inc., and Sierra Blanca Motors for the upcoming 2019 Horse Racing Season. "We have a tremendous relationship with our business partners as well as a large group of supporting businesses in this community that believe in our product," president and general manager Jeff True said. "We encourage our racing fans and those that are associated with the racing industry to support these businesses in return." City Bank, located at 1850 Sudderth Drive in Ruidoso, is the official bank of the race track. City Bank offers personal and business checking account services, commercial and personal loans, lines of credit, and home and business improvement loans among many other banking services. As part of City Banks' major corporate sponsorship, the second annual "Chile the Kid Beer and Wine Festival Sponsored by City Bank" will be held August 2, 3, 4. Thousands of racing fans and tourists attended the event last year. The festival offers the season's first sampling of Hatch green chiles, along with New Mexico-made craft beers and wines. This year, The Long Run, a Colorado-based Eagles tribute band, will be performing Friday and Saturday nights after the races as part of the festival. Sierra Blanca Motors, located at 304 US Highway 70 in Ruidoso, has been one of Ruidoso Downs Race Track's longest sponsors and has been the official auto dealership for many years. Sierra Blanca Motors provides the race track with service vehicles, as well as partnering with the race track in casino promotions. This season, Billy the Kid Casino is giving away two Sierra Blanca Motors' vehicles: a 2019 Jeep Wrangler on Sunday, July 7; and a 2019 Dodge Ram Pickup Truck on Sunday, September 1.v Sierra Blanca Motors has been in business in Ruidoso for more than 55 years, and offers Chevrolet, Buick, Cadillac, Chrysler, Dodge, Jeep, and Ram. The dealership has a large service department and offers a pre-owned sales department. Admiral Beverage, Inc., is the official beer sponsor of Ruidoso Downs Race Track, and Coors Light is the official brand. The race track offers Coors Light, Coors Banquet, Miller Lite, Tecate, Tecate Light, Dos Equis Lager, Corona, Corona Extra, Corona Premiere, Modelo, Heineken and Red Bull. "We are highlighting these partners, but we remain very grateful for all of our business sponsors that understand the value of what the race track represents," True said. "Our races draw nearly 250,000 fans during the summer racing season and our facility remains the number-one tourist attraction in Lincoln County." For additional Ruidoso Downs information, go to the new raceruidoso.com, visit the Ruidoso Downs Race Track and Casino Facebook page and follow Ruidoso Downs on Twitter @RuiPressBox. 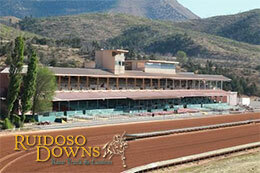 For Ruidoso Downs racing news CLICK HERE.